I did 18 cards for the upcoming Upper Deck trading card set. I took these in a direction that I don’t think anyone has ever gone in so far. 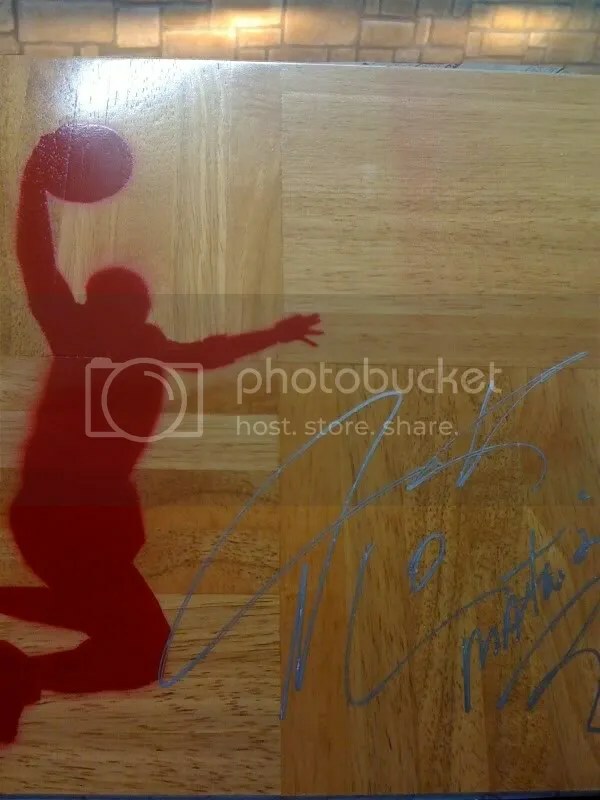 Going outside of the box to try to create a unique piece of art that hopefully will appeal to the collector community. Up first, a 4 piece puzzle. On this one I went for a less modern look, something not quite finished, something rough, and something you can’t find on a sketch card most of the time. So, I used vintage pages, then pulled them off creating a rough pallet. Then applied a quick layer of paint, then a bit of stencil work, then a bit more paint. To make it pop, polyurethane. These are pretty thick. I have been told that these will be randomly inserted into packs. 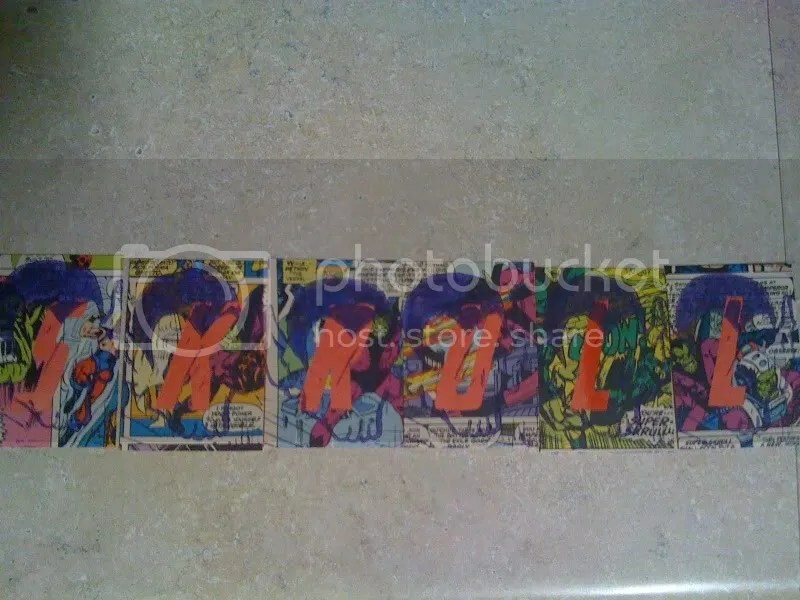 Up next a 6 piece Skrull puzzle. 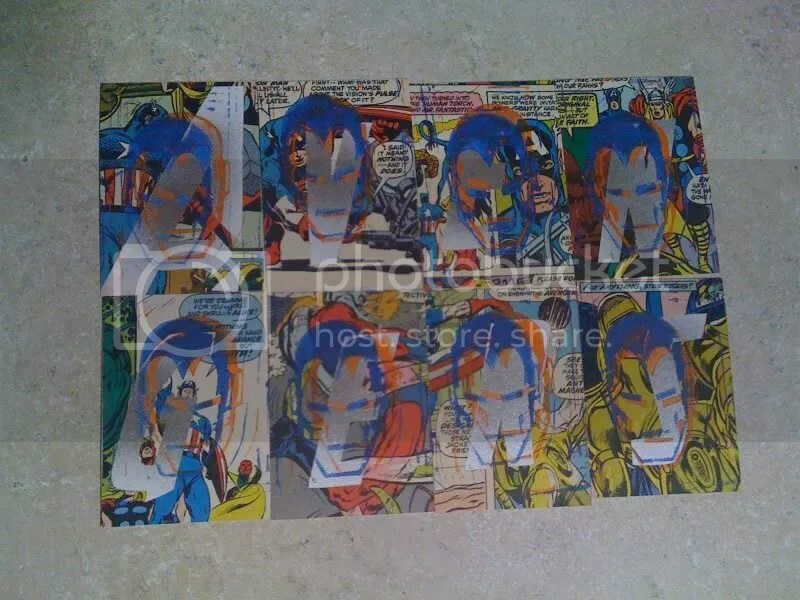 On these, it’s actual vintage pages cut out of the Avengers books. 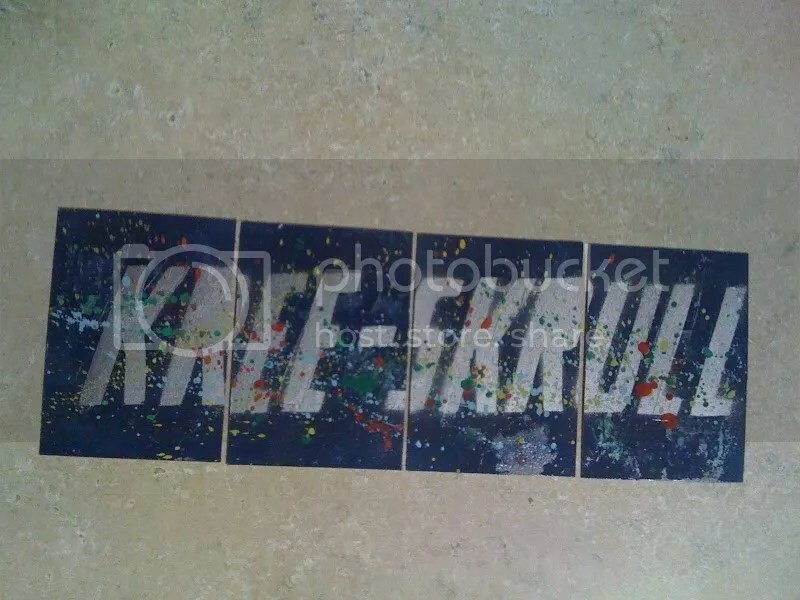 Then the SKRULL hand cut out and attached to the cardstock that was previously colored. To top it off, a Skrull linocut in purple. I have been told that these will be randomly inserted into packs. Last but not least, the 8 card Avengers puzzle. Like the Skrull puzzle, these are actual vintage pages from actual Avengers comics from the Kree Skrull war story. The linocut is Iron Man, and I used two colors on each to give it a wilder look and effect. I have been told that these may all be inserted into one single pack. Thanks for looking, and I hope that you enjoy these as much as I enjoyed making them. They took a while, all the hand cutting and lino cutting is time consuming. But it’s worth it in the long run I think. The “Kree-Skrull War” is a story arc that was written by Roy Thomas, and drawn by Sal Buscema, Neal Adams, and John Buscema. The story was originally published in the Marvel Comics comic book title Avengers #89 – 97 (June 1971 – March 1972). The “Kree-Skrull War” is notable for its cosmic scope of interstellar warfare, enormous cast of characters, use of metaphor and allegory and the introduction of the Vision-Scarlet Witch romance, which became an ongoing theme for the characters (and by default the Avengers) for years to come. The “Kree-Skrull War” is considered by critics to be a highlight of its era and is the culmination of a string of notable Thomas-Adams collaborations from this period, which began with their run on X-Men in 1969. Upper Deck and Marvel are teaming up for a fresh take on the Kree/Skrull war from Avengers (issues 89 through 97) in the early 70’s. I am a participating sketch card artist on this set. I am on board for 18 cards. These cards will be like nothing else you have ever seen before on a sketch card. A quick synopsis: I did three puzzles spelling AVENGERS, KREE, and KREE-SKRULL. I have early word that the Avengers puzzle may be inserted all into one pack. I’m torn on whether or not to show them off, or let them be posted by the people that pull them. These cards will all have a combination of paint, polyurethane, ink, and vintage comic pages. The AP’s are more of a throwback to a early era of comics, a homage so to speak. They are paint, with a linocut, more paint, then a nice coat of polyurethane to really make these pop. Put together an entirely new comic book complete with original artwork chronicling untold tales of the Kree-Skrull War from Marvel’s popular Avengers comic books! * Story pages turn front to back just like a standard comic book and are made up of 9 cards per page! * Will be the only way for Marvel fans to read new stories from the Kree-Skrull War, which took place between Avengers #89-#97. * Variant cover art by Paul Renaud (Hawkeye and Mockingbird)Collect all 190 cards that form the comic book featuring 5 action-packed stories! * Features Thor, Iron Man, Captain America, and Vision in a great space epic where our heroes battle the entire Skrull Armada without a ship of their own all while racing against a deadly ticking clock! * Features Quicksilver and Scarlet Witch battling a squadron of Skrull Soldiers in an attempt to escape from their captors on the Skrull Homeworld! * Follows Nick Fury as he infiltrates an underground bunker loaded with traps in an attempt to rescue a kidnapped U.S. Senator that has been replaced by a Skrull! * The renowned warrior known as Super-Skrull makes a desperate attempt at dethroning the Skrull Emperor permanently! * Takes place after Avengers #94, page 16. * An uplifting and action-packed story taking place during the main story (“Sacrifice”) featuring Captain America who happens upon a group of Skrull soldiers trying to save some of their brothers-in-arms from imminent death. Will Captain America put himself in the face of danger to lend a hand? * Including short printed black and white and variant art cover versions! Some of my work is done using a style referred to as a linocut. 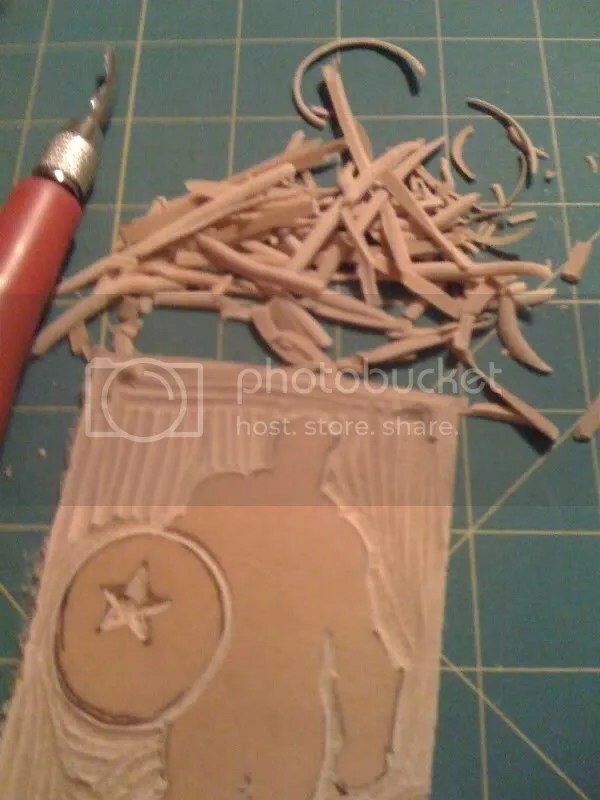 What is a linocut? As the material being carved has no particular direction to its grain and does not tend to split, it is easier to obtain certain artistic effects with Lino than with most woods, although the resultant prints can lack the often angular grainy character of woodcuts and engravings. Lino is much easier to cut than wood; especially when heated, but the pressure of the printing process degrades the plate faster and it is difficult to create larger works due to the material’s fragility. Colour linocuts can be made by using a different block for each colour as in a woodcut, but, as Pablo Picasso demonstrated quite effectively, such prints can also be achieved using a single piece of linoleum in what is called the ‘reductive’ print method. Essentially, after each successive colour is imprinted onto the paper, the artist then cleans the lino plate and cuts away what will not be imprinted for the subsequently applied color. I have used this method on a couple of sketch card sets, I may be one of the only artists employing this method for traditional sketch cards. 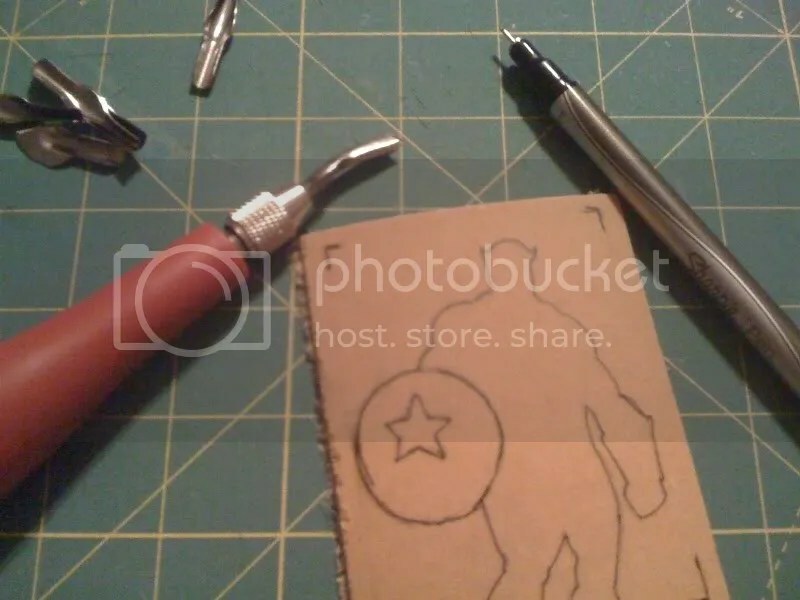 Here is an example of the process used for the current Captain America: The First Avenger set released by Upper Deck. On these, it was a combination of linocut, stencil, and some traditional art. 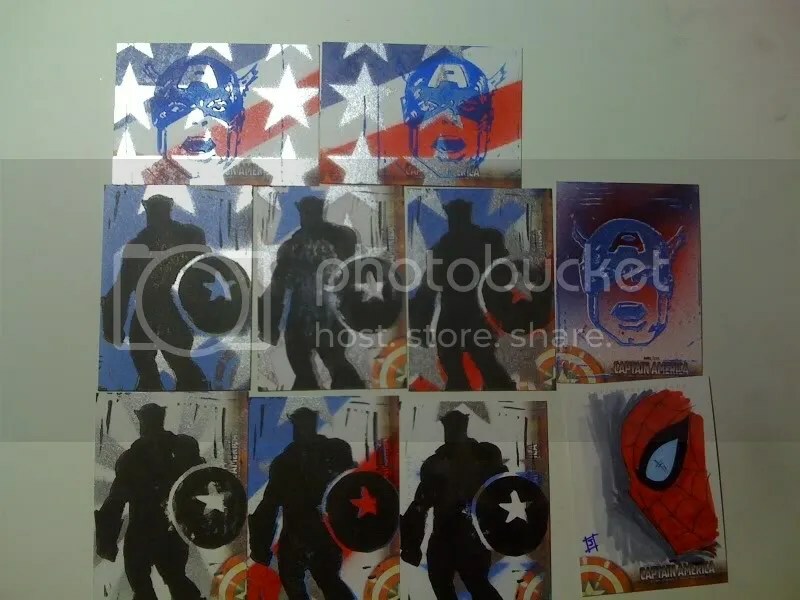 The First Avenger takes to the screen and is captured in Upper Deck’s Captain America Movie Trading Card set featuring highly collectible cards showcasing many of the memorable moments from the movie. 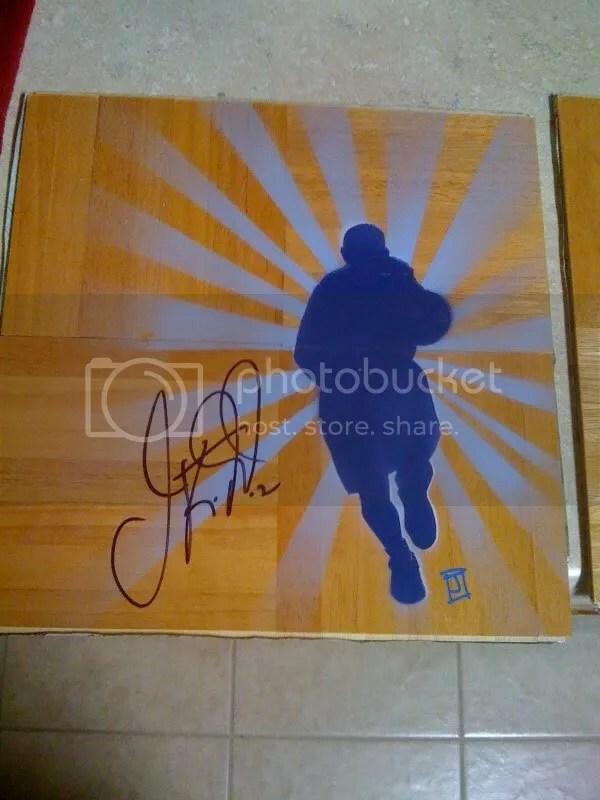 Autographs from the cast, movie memorabilia, and some of the recognizable manufactured patches seen in the film provide a great chase for collectors to try and get a piece of the movie and its stars! Get 2 of the following per box! Chase one of a kind artist sketch cards from some of the greatest comic artists in the industry – at least 10 per case! Get manufactured insignia patch cards featuring some of the famous uniform logos and patches prevalent in the movie! Captain America Memorabilia and Autograph Cards! A couple more cards for the CBLDF Liberty card set. Jim Valentinos Shadowhawk from Image. And a Beanworld character from Larry Marder which can be found here. The latest Cryptozoic blog post about this card set can be found here. Give this set a look, there is some top notch talent on board for this set. Some real legends in the comic book industry. The Comic Book Legal Defense Fund defends freedom and extends a helping hand to comic book retailers, creators, publishers, and readers whose first amendment rights are challenged. When comic book artist’s rights are attacked in the US or they encounter problems abroad, the CBLDF is there to make sure their voices are heard. The organization also protects our ability to own those comics because some people are always going to try to dictate what we can buy and whom we can choose to support. Absurd, isn’t it? We here at Cryptozoic Entertainment have combined forces with the CBLDF to publish the Liberty Trading Card set to do our part as hobbyists and collectors in supporting this cause. So many creative minds have lent their hand in creating this product, and for that we are thankful. 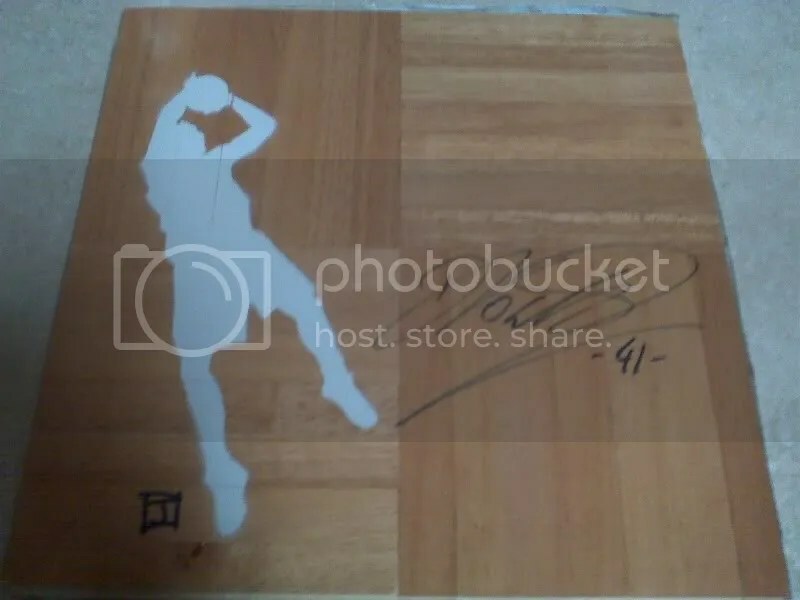 In today’s update, we want to show you Neil Gaiman’s autograph cards. He’s been an active supporter of the Fund for years. 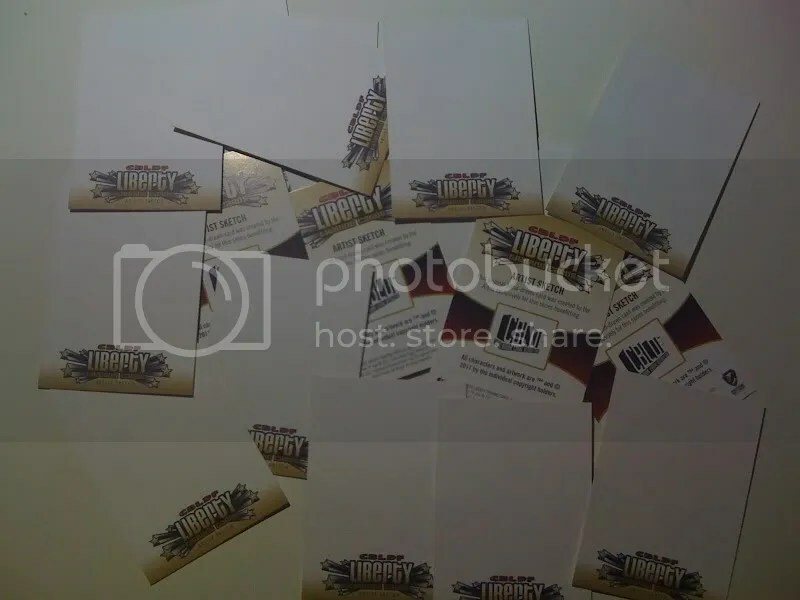 Busy with his schedule of writing an episode of Doctor Who and celebrating the 10th anniversary of American Gods with a reading tour, Neil was kind enough to donate his time and pen to the Liberty Trading Card set. 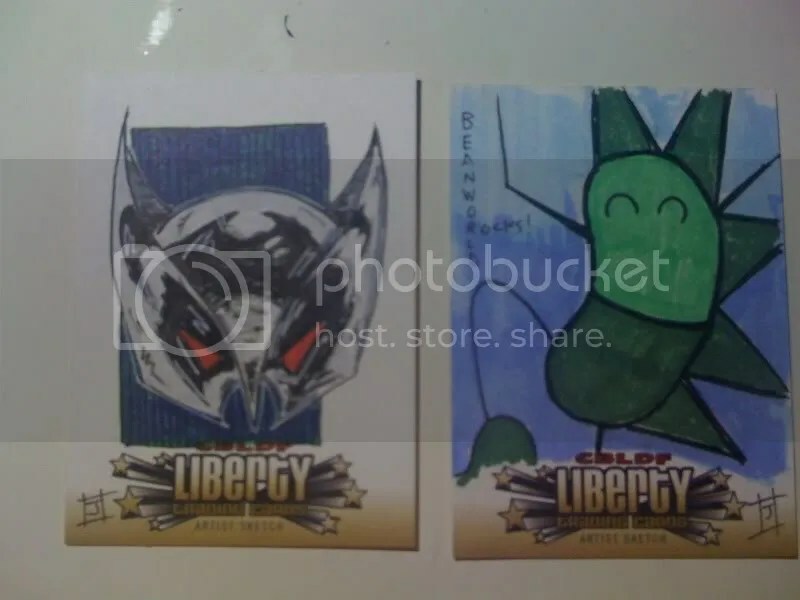 So, in addition to the combo sketch and autograph cards he Tweeted two weeks ago, a pack of Liberty Trading Cards could contain Gaiman’s autograph—or something maybe a little more. Check out these beauties. 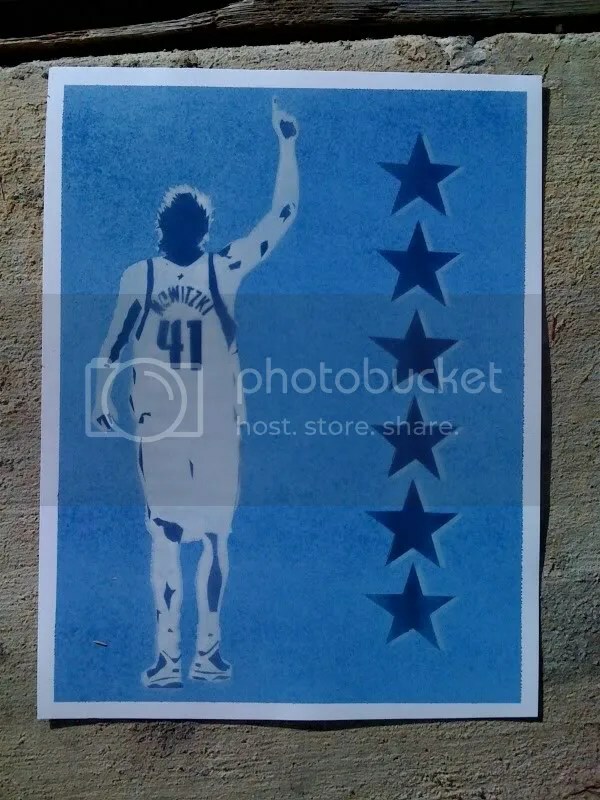 I’ve done a few pieces in the past with the Mavericks as the subject matter. Super excited they won it all this year. 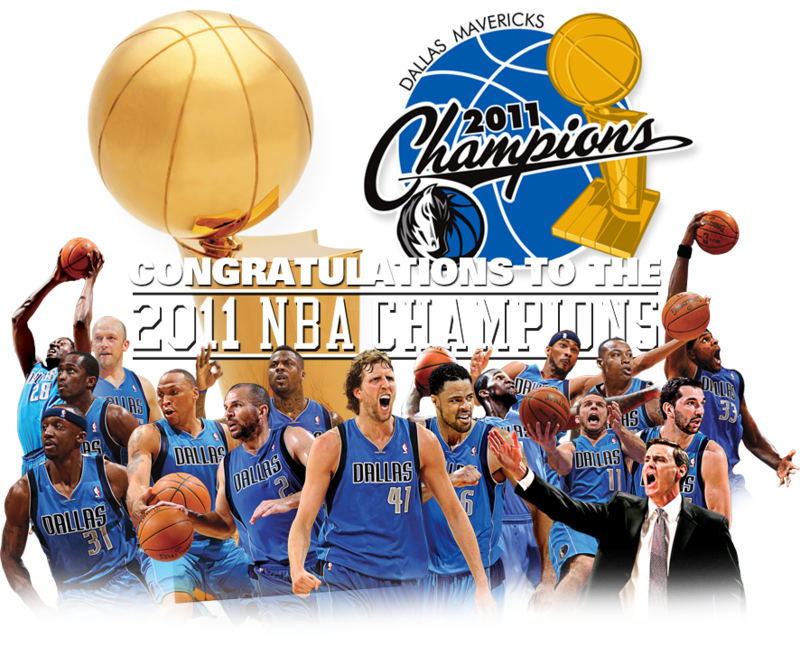 Congratulations to the entire organization, very humble, very classy, and proven winners. Here is some of the art I’ve done in the past. I’ve gotten permission to show a couple of these off. Overlord from Erik Larsen’s Savage Dragon and a couple of Todd McFarlane’s Spawn. And check out http://www.cryptozoic.com for more details on the release of this set. I’m on board for a few sketch cards for the CBLDF trading card set. When I get approval to show a few of my cards off I will. Until then, here is a little info about the set. In comic books, the hero must battle an out-of-this-world villain in a world of fantasy. In our world, there are real-life villains as well. To this day, artistic expression and free speech are challenged in the comic book industry. The Comic Book Legal Defense Fund (CBLDF) is a non-profit organization that comes to the aid of those artists who are threatened by censorship and other legal troubles. Supported by some of the most acclaimed creators and artists in the industry, the CBLDF has long been a champion of free speech. This trading card set showcases some of the historic legal battles comic books have had to overcome from the Seduction of the Innocent era in the 1950s to the modern day. 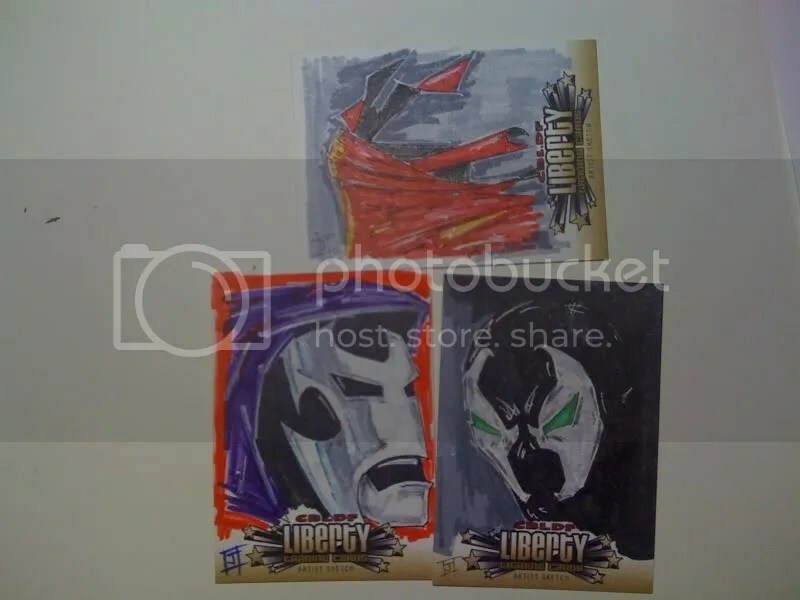 In addition to the base set, special hand drawn sketch cards and autograph cards by some of the top talent in the comic book world will be featured! Erik Larsen, Charlie Adlard, Rob Liefeld, Frank Quitely and Terry Moore are just a few artists who will be doing sketch cards. Plus, autographs can be found from such names as Geoff Johns, Neil Gaiman, Jeff Smith, Gail Simone and Robert Kirkman. To support the organization and its mission, all proceeds from the CBLDF Liberty trading cards go to the CBLDF. The guys over at http://mutantaday.com have been kind enough to do a small write up on some of my art. They are a couple of cool dudes that I met at the Dallas Comic Con. I encourage you to check them out for yourselves and see what they are all about. I knocked out a couple of new pieces. 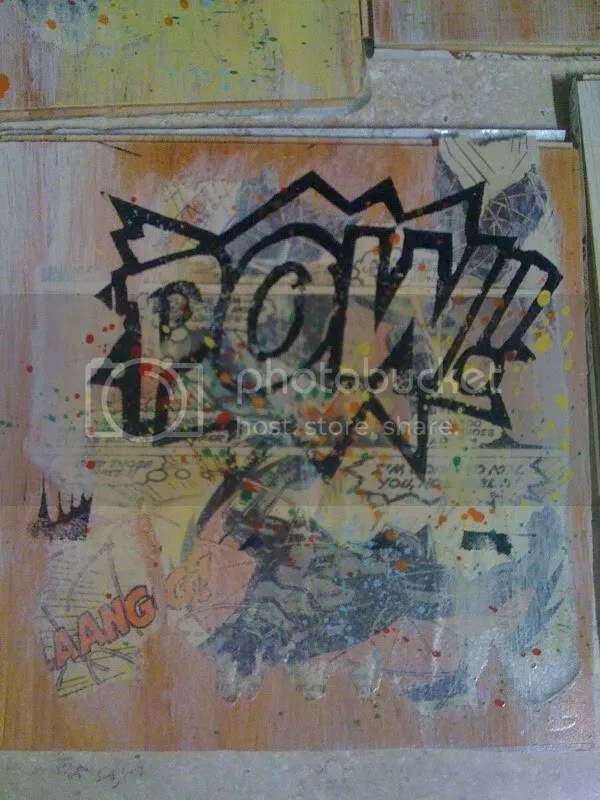 These are vintage comic pieces attached to wood. 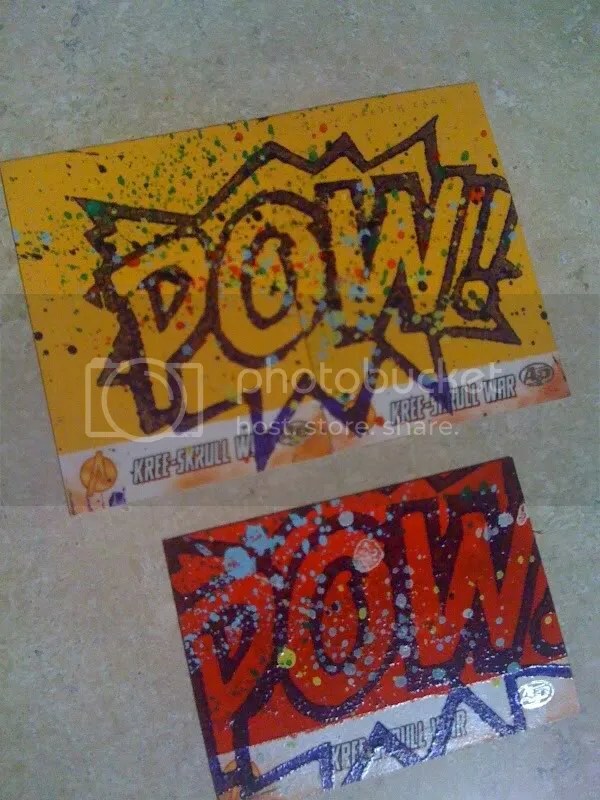 Add a touch of paint, a linocut POW! and BAM! pressed on, then another touch of paint. Then a little polyurethane on top to protect everything involved. Captain America: The First Avenger, the movie. In theaters July 22, 2011. Upper Deck is releasing trading card set based on the movie. I am a participating sketch card artist on this set. 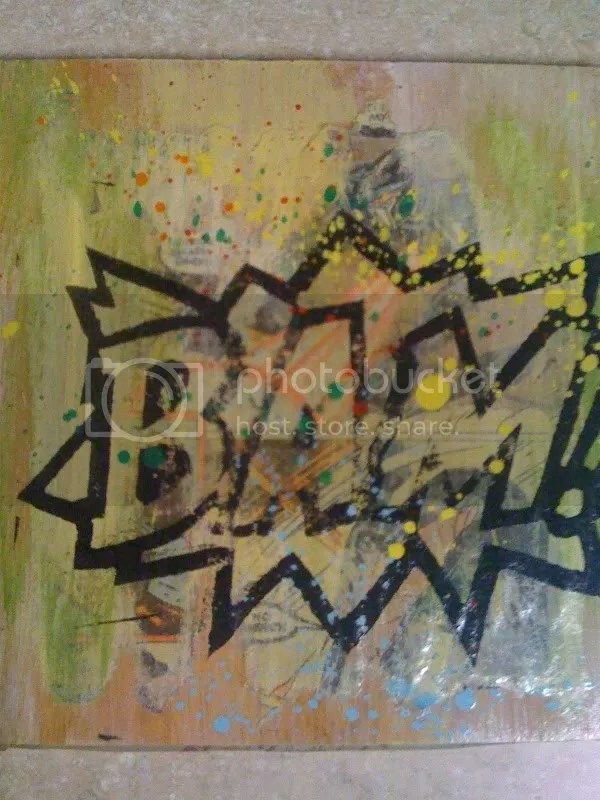 I’ve used stencils, spray paint, linocuts, ink, pencils, markers, etc…. on these cards. Everything done by hand on each card. Here is an example of a few cards I did. I’m pretty sure there will be less than 30 total inserted. Two (2) movie memorabilia cards or autographs per box! Well, here we go. I am finally getting around to trying to establish a web presence. Over time I will share art here, I will list original art I will have available for purchase, and I will have information for commission information.